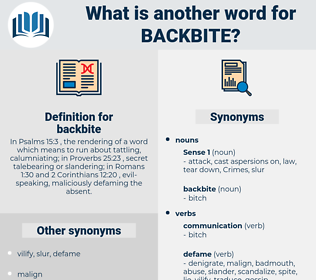 What is another word for backbite? In Psalms 15:3 , the rendering of a word which means to run about tattling, calumniating; in Proverbs 25:23 , secret talebearing or slandering; in Romans 1:30 and 2 Corinthians 12:20 , evil-speaking, maliciously defaming the absent. commend, honor, flatter, praise, compliment, cherish, help. defend, eulogize, laud, extol, vindicate. 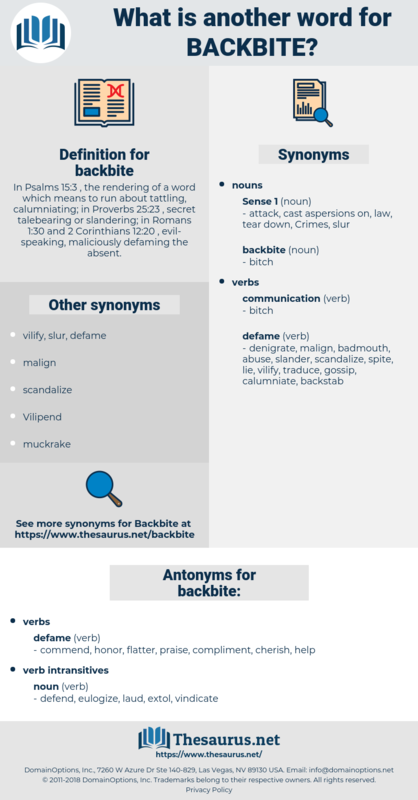 backbeat, Book of Obadiah, bespot, bicuspid, biosafety, bicuspidate, box-shaped, backswept, busybody, baby's bed, boskopoid, bag-shaped, bigfoot, busybodied. complain, sound off, kick, plain, quetch, kvetch.